Skin cancer is growth of abnormal skin cells, occurring in fair skin people who have been exposed to too much sun. If untreated they can spread to other parts of the body. Therefore, they should be treated promptly. 70% of Australians will develop a skin cancer, occurring in fair skinned people. Those who burn readily and do not easily develop a suntan are at a higher risk. 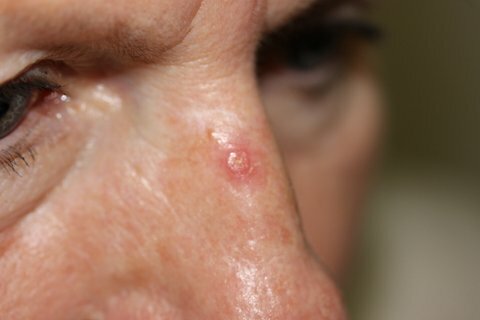 The older you are, the more sun, the more likely your are to develop a skin cancer. A higher rate in Queensland than Tasmania due to stronger sun. Skin cancers increase in size and depth of invasion with time and therefore should be treated promptly. Three main types arising from a different cell within the skin. 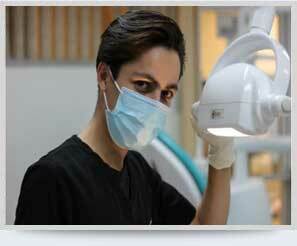 Most common, especially on the face, growing slowly over 6 to 12 months when it is very obvious at that stage. Starts as a small round lump, which is red or pale scar like, as it grows becomes an ulcer with bleeding. 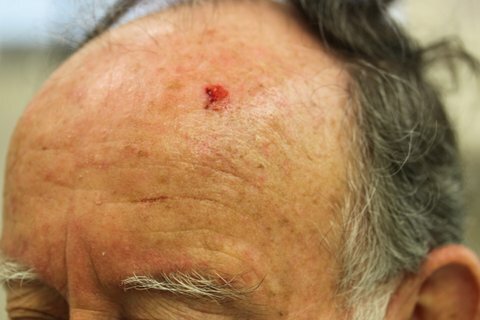 Basal Cell Cancer on left forehead showing excision with a flap repair of the defect after excision. Growing faster than the basal cell cancer, usually over a period of weeks to several months, seen on the face, neck, arms and legs. Looks like a red raised scaly bump, becoming a bleeding ulcer over months. 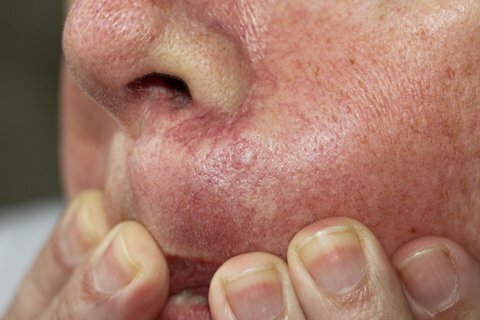 The more aggressive of these lesions can spread into nerves, blood vessels, lymphatics and to other parts of the body if not treated early. Squamous cell cancer on back of calf showing excision with flap repair of the defect after excision. 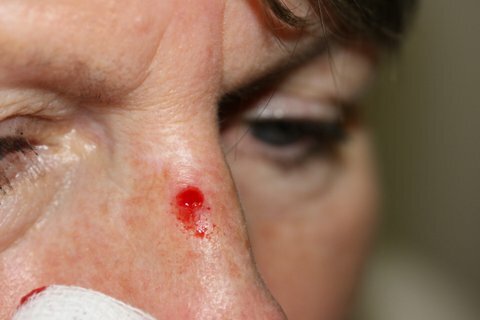 A highly malignant skin cancer, however, uncommon compared to the other two, occurring in only 1 in 20 people with skin cancer. It must be emphasised that they are very curable if diagnosed and treated early – over 80% of people survive. They can occur on any part of the body, even in unexposed areas to sun, but more common in sundamaged skin. In women melanomas are more common on arms and legs, men on face and back. One half of all melanomas arise in normal skin. 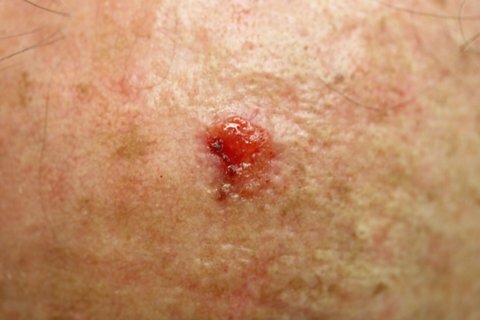 A new pigmented lesion growing over 2 to 6 months to over 6mm in size as flat or a raised lump, you should make your doctor aware. The other half of all melanomas arise in a pre-existing mole with a change occurring. The ABCD approach helps identify a suspicious change in a mole. Practice frequent examinations, either self or a friend, 3 to 4 times a year. Let your doctor know of a change. Cosmetic Surgery Sydney obtains prompt diagnosis, within 2 days, of skin cancers by performing immediate biopsies then examination under the microscope. 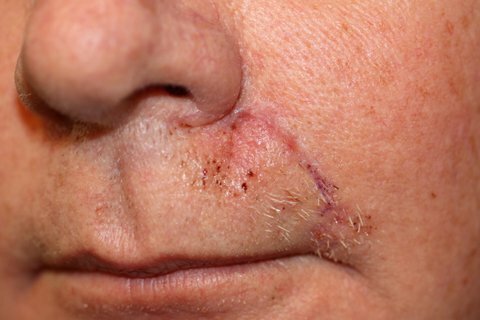 In the Manly rooms BCC’s/SCC’s have an immediate shave or punch biopsy under local anaesthetic at the time of consultation. 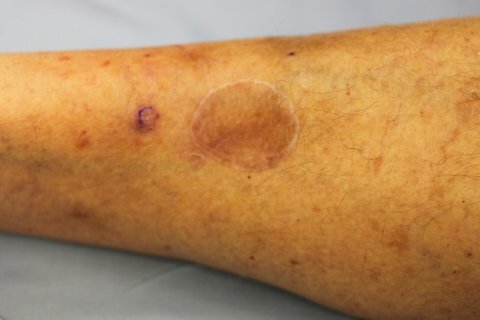 A suspected melanoma is excised with suture repair in a Day Surgery Centre within 24 hours of consultation with results 2 days later. This offers the best results of a cure. Early diagnosis is life saving. 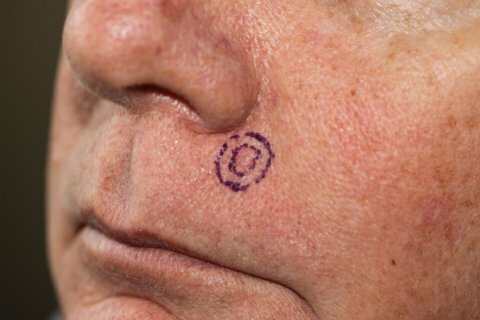 Query a basal cell cancer on nose. Shave biopsy in rooms to obtain diagnosis. Cosmetic Surgery Sydney uses all available technology in the treatment of skin cancers, performed in a Day Surgery Centre under local anaesthetic with or without sedation taking into account many factors of age, general health, type and size of the cancer and the surgical technique to be performed. 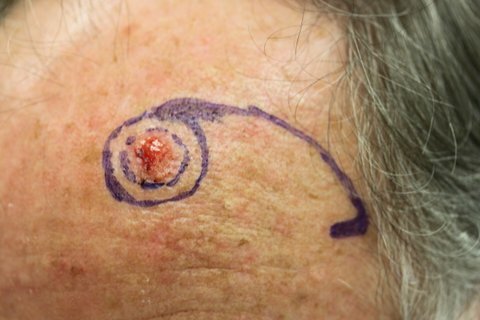 The cancer is excised with healthy surrounding skin as an ellipse running along a wrinkle line, and is 2 to 3 times longer than the lesion in order to avoid bunching of the skin at the ends (dog ears) to obtain a flap incisional line. The wound is taped for 7 to 10 days, then removed, all sutures are internal. The pathology report is given to patient of the clearance. This is a minor operation, under local anaesthetic, with sedation if needed, can be provided performed in a Day Surgery Clinic. 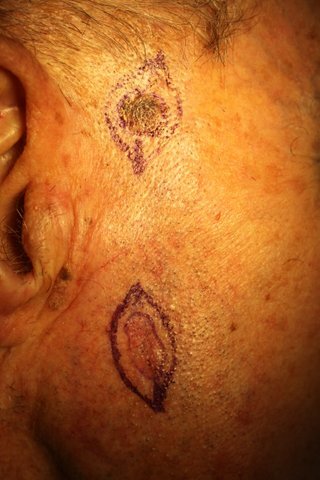 Melanoma upper right cheek and a basal cell cancer lower, simple elliptical excision performed. 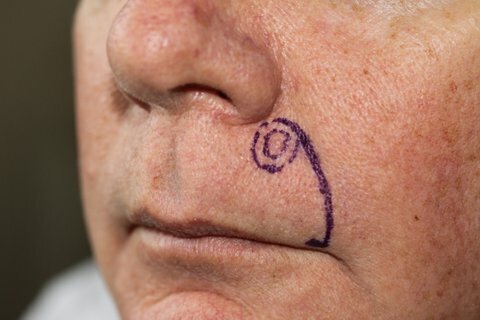 A wedge shaped section is removed when the cancer is near the edge of the lip, nostril, eyelid or ear with the edges of the excision gently sutured together to reform the edge. Due to the larger size of the cancer a lot of skin is removed and the surgeon is unable to pull the edges of the healthy skin together, so a skin graft is used to close the defect. Skin grafts may be either split skin, or full thickness skin. A thin layer of skin is split from normal skin in a healthy part of the body, usually the leg or buttock. 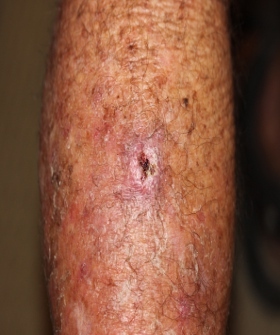 This split skin graft is then sutured into the gap created by removal of the lesion. A pressure dressing is placed over the graft and inspected at 7 days. The donor site heals by 14 days, leaves a white scarred area. Skin graft on lower leg, and now a further BCC developing below it. b. Full thickness skin graft. This is a thicker graft used on the face, and other sites to improve the cosmetic appearance. Taken from excess of skin around the ear, neck, the inner aspect upper arm. 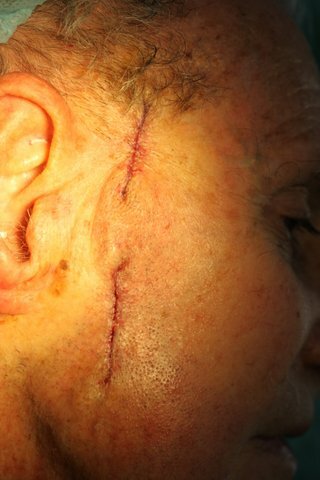 The donor site is sutured to leave a linear scar. 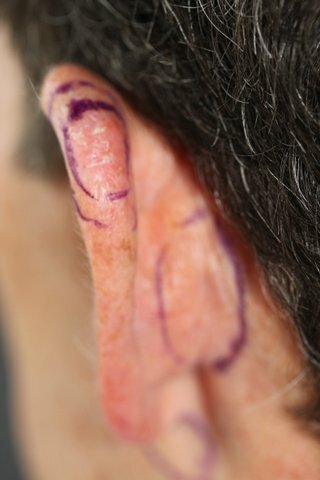 Basal cell cancer on helical margin of ear showing excision, with full thickness skin graft repair taken from sulcus of the ear. Full thickness skin grafts to nasal tip after excision of skin cancers. Settle well over twelve months. After excision, nearby loose and excess local skin can be pulled into the defect for closure. This is called a skin flap. To achieve the best cosmetic result a variety of different skin flap techniques are used. Pre Op. BCC disease upper lip with the flap repair to the defect. Post Op. One week after surgery showing flap repair.